This usually happens in bookstores. Or if there’s someone near me in Goodwill, browsing the same shelf, I’m looking at the in my periphery, trying to see what books they’re considering. I’ve never shouted “Don’t get that one, it’s terrible!” Although I have considered it. 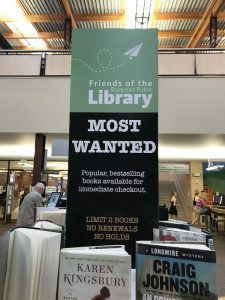 This week while circling the “Most Wanted” display at my library, the woman to my left picked up Do Not Become Alarmed, which I recently read and thoroughly enjoyed, so I leaned over and told her that. Most people respond to such unsolicited reviews with “Okay, thanks,” but this lady (who later introduced herself as Margaret and seemed as excited about books as I am!) said she was hoping to find that particular book on the shelf, and asked if I’d read the author’s previous novel, which I haven’t Then she reached for Commonwealth by Ann Patchett, asking if I’d read it, which I have. 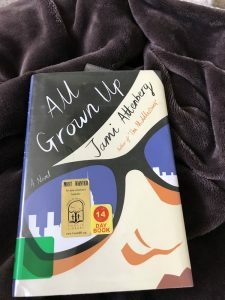 We stood looking at titles silently for a moment, then she picked up All Grown Up by Jami Attenberg, highly recommending the author’s previous novel The Middlesteins, and claiming this one is good as well. She described this book as “belligerent,” which I didn’t quite understand. I looked at the cover and wasn’t feeling the love. I feigned interest as I skimmed the blurb on the inner dust jacket. I had zero interest in reading this book. I almost put it back right then, but Margaret was still standing beside me and it didn’t feel right. We continued chatting and browsing for a few minutes, then wished each other a nice day and parted ways. She doubled back to recommend her favorite author, Elizabeth Strout (whose novels I like a great deal.) I eventually wandered off still clutching All Grown Up, though fully intending to return it to the shelf before I left the library. I looked the book over again before putting it back, and decided to check it out and read it. I rarely get recommendations from strangers, Margaret and I seem to have similar tastes, and hey if nothing else it’s an interesting social experiment and I can blog about it! When I give a book recommendation to someone, even if it’s a stranger in passing, I like to think the recipient follows through, and even enjoys the book. I started the book the next day. The cover and title give off a strong “chick lit” vibe. And while I have read my fair share of that genre in my younger years, I like to think I’ve had my fill, hopefully having developed a more sophisticated literary palate by now. I finished the book in three days, which at 197 pages, isn’t a huge feat for me. Though I’m happy to report I thoroughly enjoyed the novel! I think by “beligerant,” Margaret was referring to how this book is “in your face.” Or at least the narrator is. The first chapter is written in second person, which is quite unique and I wasn’t sure I could handle a whole book in that form. The rest is in first person and Andrea, our narrator, is not what I would call likable. She comes across as selfish, and generally annoying. However, when you stop to consider the amount of time this book covers, Andrea’s behaviors and her whole life, become more understandable, and even relatable. I was disappointed in her sometimes, yet as a woman approaching 40 who has chosen to remain childless, I also felt sympathetic to her. Sometimes funny, sometimes sad, this is a strikingly honest look at a woman’s life from her point of view. I gave the book a three star rating on Goodreads, meaning “I liked it.” I would have given it four stars (“I really liked it”) except that I wasn’t satisfied with the ending. I also feel the blurb inside the dust jacket gave a much different impression of the story than what it actually is. Choosing to read this book was the right move. It was a wonderful experience, following the recommendation of a fellow bibliophile. 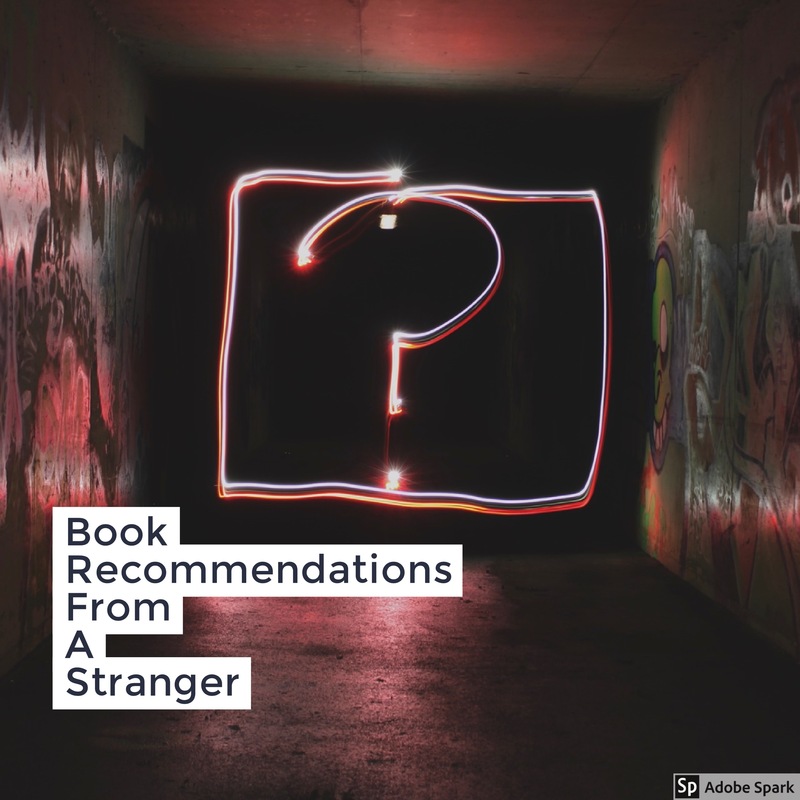 What would you have done with a stranger’s recommendation in the library? Have you read this book? Or are you interested in it now? I would read it especially after the context of your dialogue. I’ve done a huge amount of recommending and I’m interested in the book now. I probably wouldn’t have talked to a stranger like that in the first place. But if I had and someone had recommended it, I may have given it a try for the same reasons you did. Glad you liked it. I looked it up on Goodreads when I got home from the library that day, and saw you had it marked as To Read so I figured that was another vote in its favor! 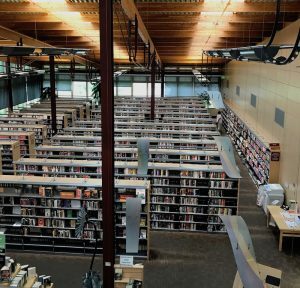 If you saw a stranger at the library handling a book you thoroughly enjoyed, would you speak up?